Results of Cambodia’s 5th parliamentary elections today showed stunning political gains for Sam Rainsy’s opposition coalition in the capital of Phnom Penh itself and in various provinces. It constitutes unmistakable wake-up call for strongman Hun Sen.
Phnom Penh, Cambodia---When I was invited by former Speaker Jose de Venecia, Founding President of the Centrist Asia-Pacific Democrats International (CAPDI) and Founding Chair of the International Conference of Asian Political Parties (ICAPP), to join the prestigious international team of over 60 delegates from Asia, the Middle East, Europe and North America that he assembled to monitor Cambodia’s 5th parliamentary elections, I eagerly signed up. I hadn’t been back in Phnom Penh since my husband ended his nearly four-year stint as Philippine ambassador here in November 1998. President Fidel Ramos wanted an ex-military man to reopen the embassy here after it was closed down by Ambassador Rogelio de la Rosa in the mid-70s, owing to the turmoil and misery caused in this country by the genocidal Khmer Rouge. Thus, it was good to be back in the Cambodian capital and I marveled at the visible progress all around---new imposing government and private buildings and homes, landscaped streets and parks, numerous new business enterprises, etc. But it was the parliamentary elections today that brought me here, the 5thsince the UN-sponsored elections in 1993, and like the other delegates I was fully aware that today’s political exercise for the Cambodian people is bound to be historic and epochal for a number of reasons. For one, this is the first time since the mid-90s that the 20-year rule of Cambodia’s strongman, Prime Minister Hun Sen, is being challenged very seriously---this time by an ascetic-looking bespectacled intellectual leader recently returned from exile, former Finance Minister Sam Rainsy, whose political coalition swept Phnom Penh in today’s elections. 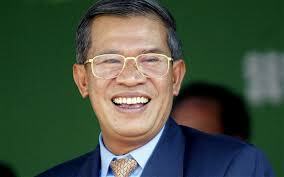 Reports indicate that he’s also raking in victories in various provinces, including in Hun Sen’s birthplace in Kompong Cham. What’s interesting is that Rainsy is not even a candidate in today’s elections as he was not allowed to run by two government institutions; yet he’s very much the protagonist against Hun Sen.
To understand the significance of today’s elections, it should be noted that in the mid-1990s, the keen political rivalry between Prime Minister Hun Sen and Prince Norodom Ranariddh was sought to be settled by various mediators through a most unique political experiment---a power-sharing where the two rivals were declared “co-Prime Ministers.” But in July 1997 Hun Sen pulled a coup with the help of the Army and dethroned Ranariddh, grabbing power for himself. The debonair Prince, son of the fabled King Norodom Sihanouk, went on exile for a while, and then later staged a comeback to head Parliament; but subsequent developments in the arena of the heart eclipsed Ranariddh from public view totally and Hun Sen has since dominated the political stage here, bringing stability and development to this once-seething and turbulent country. Today’s elections, however, have aroused enormous frenzied excitement among Cambodians, but alas, they also harbor an enormous potential for destabilizing political violence in their aftermath--- the most serious possible threat to Cambodia’s stability in nearly two decades. The challenger in today’s elections is the tall, lean former Finance Secretary, Sam Rainsy, who had returned just a week ago from four-year self-exile in France, after he escaped serving a harsh 11-year imprisonment sentence that was popularly regarded as politically motivated. He was charged with inciting followers to pull out border markers along the Vietnamese border that allegedly were eating into Cambodian territory---thus whipping up centuries-old border animosities between the two neighbors. Rainsy was pardoned and allowed to return by reigning King Sihamoni, son and successor of the late legendary King Sihanouk who died late last year at age 90. But when Rainsy asked to be returned to his old National Assembly seat and secure his voting right as a citizen, so he could run in today’s national elections, ruling Assembly officials and the Constitutional Council of Cambodia, its highest judicial body, thumbed down both requests. The flimsy excuse for rejecting Rainsy’s petition to run in today’s elections was that he failed to beat the deadline for filing of his candidacy, but it’s far more complicated than that. 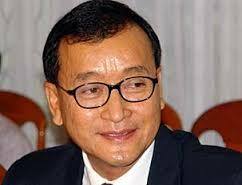 While in exile his Sam Rainsy Party (SRP) had remained vacant, and he then merged it with the small Human Rights Party to form the Cambodia National Rescue Party (CNRP) that had held 29 seats in Parliament. But apparently the National Assembly’s permanent committee, controlled by Hun Sen’s allies from his Cambodian People’s Party (CPP), was determined to stop Rainsy’s political come-back. It stripped all CNRP representatives of their parliamentary seats earlier this year, in order to force Rainsy to resign as CNRP president and rejoin and revive his now defunct SRP. Time had run out. All these setbacks for Rainsy, however, made him very much the underdog even if he wasn’t running any longer, and when he returned to Cambodia a week ago, tens of thousands of people choked the streets of Phnom Penh to catch a glimpse of him---folk hero and political martyr personified. In the few days since his arrival he has been campaigning up and down the country, reaping the same frenzied reception and firing up the hitherto listless campaign of the opposition against the long-entrenched administration. Rainsy has accused the regime's top leaders of corruption that has impoverished the people, land-grabbing, ostentatious display of wealth and curtailment of freedoms, especially that of the opposition press. The international monitors led by former Speaker Joe de Venecia quickly noted the difference between the studied exhilaration of CPP’s blue-and-white uniformed recruits among government workers and state college students lining the streets of Phnom Penh and snaking around in their decorated trucks and motorcycles, vs. the frenetic and spontaneous exuberance of Rainsy’s followers among the young people and lower-income workers such as the market vendors and bar and restaurant waiters. At polling places international observers from ICAPP and CAPDI visited in the capital, Rainsy’s followers were delirious with joy when results showing his coalition’s generous victories were announced. In one school compound people with misty eyes clapped heartily for us observers. One elderly woman tried to grab team leader Joe de Venecia’s hands after the counting was over---as if to say, we know you helped keep the elections free and fair here, thank you so much. As poll results are being awaited from various provinces, it’s still not known just how honest and violence-free the elections went outside the capital. The observers in Phnom Penh heard many complaints about names missing from voters’ lists, double-use of names, not so indelible ink, etc. This evening many army trucks bearing fatigue-clad troops surrounded the Prime Minister's imposing residence, perhaps to forestall any possible trouble from election malcontents. The CPP with its 20-year reign is expected to still retain its lead in Parliament. But definitely today’s elections that showed the Rainsy coalition’s amazing strength (doubling its Assembly seats from the previous 29) despite the so little time he was able to campaign for it indicates an unmistakable wake-up call for reforms for Cambodia’s strongman Hun Sen.
What lies ahead for this once-turbulent nation? No one can tell at this point. Is ‘Blue Eagle the King’ now the official hail-to-the-chief hymn? Was it played at the SONA to make sip-sip to the Ateneo alumnus president? Long litany of small achievements and target promises at 1.45 min. SONA, but toughest and most contentious issues evaded---to make masses feel good and slam critics about ‘noynoying?’ But these issues don’t go away by not talking about them. I have been attending State of the Nation addresses since the time of President Corazon Aquino, but last Monday’s 4th SONA of President Noynoy Aquino was the first time I ever heard a departure from the traditional processional and recessional music played within the Halls of Congress upon entry and exit of the President during the Sona. Instead of the traditional “Mabuhay” Overture, the House chose to play instead “Blue Eagle the King,” the Ateneo inspirational song played at games that that school participates in at the Araneta Coliseum or at MOA. I imagine that the reason for this sudden change is that House leaders wanted to play up to or get into the good graces of P-Noy, an Ateneo AB Economics alumnus, but I didn’t find that funny. The SONA is a solemn and historic occasion when the Chief Executive makes a report to the Filipino nation about the state of the country, and Congress, took a lot of pains to make every detail of the ceremony conform to tradition and ensure that invited guests behave according to dictates of protocol. Yet, they discarded the traditional Mabuhay Overture, the counterpart of the “Hail to the Chief” of the US, and the only reason I can think of is that the organizers wanted to make sipsip to P-Noy. But the irony is that a good number of Ateneans themselves found this deviation irritating. 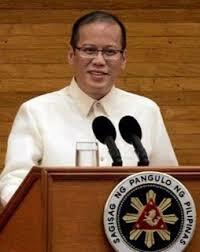 Speaking of P-Noy’s kilometric (1 hour 45 min.) SONA---the longest in local history--- it was aimed mainly at the masses watching over TV and listening to radio. He raised issues and cited accomplishments they can appreciate and that hit them in their everyday lives. Even the tenor of his speech reflected this---reports say that Isko Lopez, who writes for popular masa publications, helped couch it in the toughie language the man in the street understands. One can see why: P-Noy wants to ensure that his masa support remains with him and does not desert him at this last half of his term, when it’s easy to be a lame-duck president. He sought to appeal to the masa by stirring up old Filipino values of patriotism and righteousness, citing cops doing their jobs heroically and families being lifted out of poverty through the massive state dole-out program. For the intelligentsia and the middle and upper classes, however, many of whom have turned critical of his administration, P-Noy’s SONA strove to drive home the point that his is not a do-nothing administration, na hindi siya noynoying lang, and that things get done if right processes are followed---even if he left unstated solutions to the most contentious and toughest issues bugging the country. For instance he cited statistics on the increase in CCT dole-out coverage of Filipino families (more than 4 million by next year), in PhilHealth coverage of 80% of the population (a figure that Philippine Medical Association vice-president Dr. Leo Olarte estimates as bloated), in mass housing, classrooms, jobs, bridges and airports built (most of them began by President Macapagal Arroyo), more tourists coming in, etc. President Aquino spoke about various initiatives to be undertaken to alleviate the plight of two of the poorest of the poor Filipinos. One is the coconut farmers group which he plans to help through “inter-cropping;” but he failed to mention how the multi-billion coco-levy funds now ruled with finality by the Supreme Court as belonging to the coco farmers can be harnessed for their benefit and to rehabilitate the dying coconut industry. Then there’s the fisher-folk for whom he proposes to put up more storage facilities, so they could store fish-catch and not have to reduce 3 kilos of Lapu-Lapu into one kilo of tuyo. President Aquino, aided by graphs of present statistics and promised targets, indulged in a long litany of small achievements and obviously his aim was to give his listeners a lot of feel-good time. But his SONA studiously avoided tough and contentious issues that such annual report to the nation is expected to tackle---issues that would not be solved by not being raised. They include the grinding poverty and unemployment despite the touted 7.8% growth in the first quarter this year, which was fueled largely by pre- election spending, and the ever-widening gap between rich and poor, as shown by recent government statistics. Still no clear roadmap to economic sustainability. P-Noy avoided speaking about the following big issues: the rising criminality and drug trafficking; mitigation of terrible annual typhoons resulting from aggravating climate change; the burgeoning debt burden that will saddle each Filipino baby to be born with a P55 thousand debt on its head; the conflict with China and the controversial issue of renewed and more permanent US basing that the Cory Senate rejected in 1991; the Sabah issue and the suspended peace initiatives with the Left and the impending full accord with Muslim secessionists, especially on the controversial wealth sharing. Certainly the President did not even give a hint that he was aware of the allegations on the P10billion scam that has hit both chambers of Congress. He ignored the demand for abolition of presidential and legislative pork barrel that is at the heart of corruption (but if he did this, the assembled solons might have stopped the applause they punctuated his speech with every ten minutes). He also shelved the FOI bill once again. Interestingly the President took the occasion to shower generous praise on a number of Cabinet members, but failed to credit some of them. Peppered with praises were Secretary Armin Luistro of Education, Public Works Secretary Babes Singson and Foreign Affairs Secretary Albert del Rosario. The latter P-Noy particularly praised for persisting at DFA’s helm even if he doesn’t need this job as he is a wealthy man who made his pile in the private sector. In fact P-Noy cited how Del Rosario courageously rode through 20 checkpoints in the Libyan deserts to personally supervise the rescue of Pinoy workers during the seething turmoil there. I found that action of the DFA Chief, however, misplaced heroism---what if he were hostaged by rebels there? Wouldn’t that have aggravated our problem no end? There was praise for the late DILG Secretary Jesse Robredo but none for his successor, Secretary Mar Roxas, possibly because of allegations that his handpicked officials at his former post at DOTC were mulcting commissions from a Czech company. Neither did P-Noy have anything good for Finance Secretary Cesar Purisima and his lead agency, headed by Kim Henares. P-Noy, however, reserved heaps of criticisms on the National Irrigation Administration and the Bureaus of Customs and of Immigration and Deportation. But when Customs Chief Rufino Biazon texted his resignation after being scalded so, P-Noy rejected it. My guess is that he had second thoughts about getting rid of Biazon as he might have calculated that it would still be good to have the latter’s father, reelected LP Muntinlupa Rep. Rodolfo Biazon, on his side. But young Biazon should have resigned just the same. One should only take so much brow-beating. P10 billion scam said to involve 5 senators and 23 House members may be just tip of iceberg, as COA Chief vows to reveal more names. There’s also talk about new scam involving 50 House solons. If, as radio show asserts, Napoles contributed P100 million to LP kitty last elections, can UNA be far behind as beneficiary of her largesse? Gov't. to borrow P714 billion while CCT will involve debt servicing of $1 billion. Join campaign to abolish pork of Congress and President's, even if it’s just suntok sa bwan. On the eve of the President’s SONA there’s fierce outcry among Filipinos against scandals unearthed in recent days. The P10 billion scam allegedly involving five opposition senators and 23 House members appears to be just the tip of the iceberg, as COA Chair Grace Pulido-Tan promises additional disclosures next week. Pulido-Tan has been under great pressure to conduct full investigation of this scam and reveal all she knows---and this is only fitting and proper as anything less will not satisfy the people. For as Navotas Rep. and UNA spokesperson Toby Tiangco said recently, why does DOJ and lead agency NBI zero in only on opposition senators and representatives when by logic, given the loose control of public funds by Congress and the irresponsible manner of disbursing and monitoring by executive agencies, there doubtless are solons of various political hues implicated in this wanton abuse of public funds. But the COA Chair and NBI may have to do even more spadework. Buzzing in the highest circles of this administration---and creating squabbles among the officialdom---are reports on an alleged extortion attempt in 2011 that came to light only last year, by several DOTC officials on a Czech company called Inekon, that was interested in a contract to supply coaches for a Metro Manila light rail line. Then there’s talk in the House that a scandal hitting an NGO called “National Livelihood Development Corporation” would implicate some 50 House members in the past and present administrations. This week, too, Standard’s ace reporter Christine Herrera quoted Nueva Ecija Rep. Magnolia Antonino-Nadres, daughter of former Rep. Rodolfo Antonino, as demanding that Congress investigate the multi-million Internal Revenue Allotment and pork barrel scams in three municipalities and one city in Nueva Ecija. What Nadres’ revelation asserts is that scams involving public funds were not just a fact in the Macapagal-Arroyo administration (e.g., the P700 million fertilizer scam) but continue to happen in the ‘Daang Matuwid” administration of P-Noy---under the DBM of Secretary Butch Abad and the Departments of Agriculture and of Agrarian Reform, despite occasional show of independence by the COA Chief. Aside from the Napoles scam reports, there’s also the conditional cash transfer (CCT or more popularly known as the "Pantawid Pamilyang Pilipino Program" or 4-Ps), this year amounting to P45 billion but expected to hit P63 billion next year. The COA has been quite unhappy about the loose accounting of CCT funds. I must confess that as a constant and keen monitor of this program (through domestic staff in my family and those of relatives, who are under it), I am bothered about how disbursement of funds to enrolled families is so uneven and loosely administered. 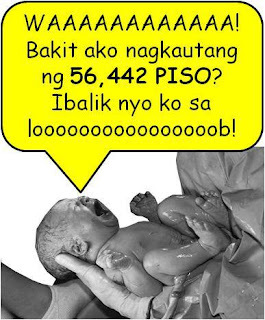 For instance, a helper of mine began receiving P1, 200 last November for herself and her three children under the 4-Ps, but the next grant through her ATM was only P500 last March, because she had skipped a visit to the barangay center for her “injectable” contraceptive. Since March up to now, however, CCT grassroots people have been merely conducting endless seminars but no cash---prompting suspicion that all the funds were spent in the recent elections; but none of the lowly women dare complain. No wonder that after P120 billion spent in CCT doleouts in six years, poverty has far from decreased; on the contrary there are many more poor Filipinos. The question is, are all the little subtractions in doleouts across the land returned to the overall CCT fund or do they line the pockets of those administering it at grassroots? What’s deplorable is that the P45 billion CCT funds this year, mostly borrowed from foreign sources, will require loan servicing costing $1 billion, or equivalent to the funds being dispensed for the poorest of the poor! In fact, in this coming fiscal year’s budget, reports say the administration will again borrow P714 billion to finance its gargantuan expenses (yes, including the CCT, the solons’ and the President’s pork barrel funds and even the P3 billion allocated this year for contraceptives under the RH Law). Indeed, each new Filipino baby to be born will already have a debt of P56,442 on its head. Just how big the scam over public funds is, we citizen can only roughly estimate. The other day, a radio personality cited buzzing reports that Janet Napoles, the alleged mastermind of the P10 billion scam, had contributed P100 million to the Liberal Party campaign in the last elections. We should hear what the LP under Chair Noynoy Aquino and incoming Senate President Franklin Drilon has to say on this serious allegation. Standard columnist Jojo Robles spun this issue of the letter that Napoles had publicly admitted to have sent P-Noy last April, wherein she complained about harassment by NBI agents. According to Robles, whose news hound’s nose is ever so sharp, Palace sources told him P-Noy acted on Napoles’ complaint “with uncharacteristic haste,” compared how he sat on Sultan Kiram letters. One common fate shared by the Napoles and Kiram letters was that the Palace couldn’t confirm or deny their existence. But assuming Robles’ sources are correct, would Napoles’ P100 million contribution to the LP kitty be the reason for P-Noy's “uncharacteristic haste” in acting on her complaint? But if Napoles indeed contributed to the LP kitty, would she fail to be just as generous to the UNA campaign? After all, several prominent UNA politicians are alleged to have participated in her scam? All these scams have raised howls from the citizens, various organizations and churches and faiths, for the outright abolition of the pork barrel system. We all know that through various administrations, politicians have benefitted from public works projects through the lagay system where they get a percentage of project costs. This is why PW projects are substandard---tinitipid ng contratista para may maibigay sa politico; but at least that old system GAVE SOMETHING to the people. But recent scams are innovative in that funds go to BOGUS or non-existent projects. That really hurts our people, most of whom are so poor and struggling for basic services. Thus the public outcry for abolition of pork barrel beginning with the President’s own Presidential Social Fund worth P70 billion annually, the senators’ P200 million each and the representatives’ P80 million a year each, from this year’s National Budget. Recall too, how key Palace henchmen stayed in the House lounge all night during two crucial votings on the RH bill, dangling the pork in an impending election year or threatening to withhold it if they vote wrong. Many of the solons were more frightened by this threat than by their bishops and they stayed away from voting. Yes, let’s all campaign to abolish the pork even if it’s suntok sa bwan. SC’s recent decision on National Artist issue does not help clarify controversy over Alvarez et al.--- it adds more confusion as to where to draw the line between two recommending boards’ authority and presidential prerogative. GMA’s EO 236 clarified that prerogative, but SC failed to dig it up---or ignored it. That four National Artists included by former President Macapagal Arroyo in the list of State-honored Artists for 2009 were struck down by the Supreme Court in a decision the other day was truly unfortunate. The award to comics King Carlo J. Caparas was controversial from the start and one of the more vocal opposition to his award came from National Artist for Literature Frankie Sionil Jose. Few, however, would question the choice of Cecile Guidote Alvarez, founder of the Philippine Educational Theater Association (PETA) and president of the 100-member nation International Theater Institute and its spokesperson for culture and development, and director of Earth Savers-Unesco Artists for Peace and Unesco Dream Center. Even fewer could question the nomination of that architect of architects, Bobby Mañosa, he of the native themes and indigenous materials, and undisputed haute couture guru Pitoy Moreno. Rather, it was the process of selection that was assailed by critics as flawed, and which the SC magistrates obviously listened to. But evidently research inside the High Court was lacking, as otherwise it would have discovered EO 236, which was signed on Sept. 19, 2003 as a mechanism whereby GMA firmly underscored the President’s prerogative to confer the Order of National Artists (created by President Marcos through a presidential decree) and making the role of the National Commission for Culture and the Arts (NCCA) and the Cultural Center of the Philippines advisory and not mandatory on the Chief Executive. The SC magistrates’ near-unanimous decision last Tuesday, however, was far from clarifying. In fact it was confusing. In other words, what the SC is saying---confusingly---is that the President could proclaim all or some or even none of the NCCA/CCP boards’ recommendees for National Artist, but he or she could not award anyone of his or her own choice. Following this reasoning of the SC, the question that arises is, if the two boards’ recommendation is ONLY DISCRETIONARY, who then has the power to appoint National Artists? If not the President, who? The artists’ world, save for a small band that expressed support for beleaguered President GMA’s action then, rallied together and hit her left and right. Artists being what they are---a very self-centered group necessarily super-bilib sa sarili if they have to survive their dog-eat-dog world---they exploded the issue in media and hailed the appointment of the four artists to the SC, in a bit to stop their proclamation. Cecile Alvarez was the lightning rod that drew much of their negative reaction, as she was then NCCA Executive Director appointed by GMA as well as a staunch anti-Marcos freedom fighter in the US. Not being able to hit GMA directly, most of the attacks by Imelda’s artist minions attacked the “poor timing” of Cecile’s selection (that’s right, it was poor timing indeed---she should have been awarded years back for her pioneering grassroots educational theater work). In fairness to Cecile, although this fact was already beclouded by emotionalism and politics, she ceased to participate in committee deliberations once she was nominated by Fr. James B. Reuter, a Magsaysay Awardee like herself, National Artist Alejandro Roces and Sen. Edgardo Angara, then chair of the Senate Committee on Culture (as the slings and arrows flew from all directions, however, Angara disappointingly did nothing to defend her despite her slavish work to promote Baler as a culture capital). I recall that as columnist of a broadsheet as the controversy raged in 2009, I had to take deep breaths about the nostrils-spitting arrogance of many artists. Somehow I was reminded of the quarrel of the fallen angels with God as told in the Bible, where they began to think they were more powerful than their Creator. Even during the time of former President Fidel Ramos, who insisted on naming the late historian Carlos Quirino National Artist in a new category, “historical literature,” there was a lot of quarrel about how far the two boards’ authority could carry them and where presidential prerogative could intrude and prevail in this issue. Interestingly, at a congressional hearing over the Alvarez et al. issue, minutes of the meetings of November 6 and December 4, 1997 of the NCCA during the FVR era came to light. And here the artistic firebrands seemed far humbler. Probably intimidated by the could-be-gruffy ex-policeman-President, the artists appeared cowed into submission; but owing to GMA’s widespread unpopularity by 2009, they regained their horns by then and fought her ferociously through proxy Cecile. The battle turned ugly and the band of four became casualties, no matter how hard Cecile and Carlo fought in the media. But what the SC magistrates failed to reckon with was the authority of the President to name awardees from outside the NCCA/CCP Boards’ list as firmly established by EO 236, issued by PGMA in September 2003, six years before the Alvarez et al. controversy erupted---which remains part of the law of the land until it’s stricken off. I suspect that the SC magistrates had no knowledge of Sec. 9 of this EO when they made their recent ruling. 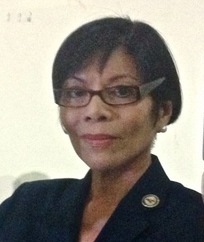 As Commissioner Carmelita Abdulrahman of the KomisyonngWikang Filipino and currently president of Pasataf, the biggest organization of language teachers in the country, explained, EO 236, headed by the Executive Secretary with five high-ranking officials of the Executive Department as members, sought to rationalize all government awards into an Honors Code, creating an Honors Committee to assist the President in selecting National Artists. This committee has the capacity to liaise with appropriate government agencies such as the NCCA and CCP for preliminary recommendation and selection, as well as to receive other nominations and consult with expert resource persons in various fields---all aimed to provide additional advice for the President’s judgment. Comparison is inevitably made with the National Medal of Arts program in the US, where the President is given a free hand as Head of State to select from names submitted by the National Council of Arts and the National Endowment of the Arts, as well as to include those of his own initiative---as long as it does not exceed a list of 12 artists annually. In the US program there appears to be no clouding the authority of the Chief Executive---HE DOES THE SELECTION. In our setting, this is being made far from clear by arrogant artists, and the highest court of the land just added to the reigning confusion. Political fight between Gina Ongsiako Reyes and Lord Allan Jay Velasco casts long shadow over Comelec, the SC and LP-dominated House. How will Speaker Belmonte fight to protect HRET, whose powers were clipped by SC majority justices' decision backing up their colleague's son, Allan Jay, vs. Gina? Is nation staring at possible constitutional crisis over a stupid electoral contest? House media buzz with reports that re-electionist candidate for Marinduque representative Lord Allan Jay Velasco of the National Unity Party will be proclaimed by Comelec this Tuesday as winner of the hotly contested and controversial election for the province's lone district---following a recent decision by the poll body en banc. With this 19-page Comelec decision penned by Commissioner Grace Padaca, Velasco would be unseating his challenger, lawyer Gina Ongsiako Reyes, who ran under the LP banner and was proclaimed winner by 4,000 votes by the provincial board of canvassers (PBOC) of Marinduque last May 18. Last June 5, based on the PBOC's proclamation, Gina Reyes was sworn into office by Speaker Feliciano Belmonte and on June 30, along with other elected representatives, she assumed office at the House where on July 1 she filed two bills. The Comelec's recent en banc’s decision to annul Reyes’ proclamation by the PBOC, however, was sadly based on an issue that should have been settled even before the elections: that Reyes is allegedly an American citizen and lacked the one-year residency requirement to qualify as congressional candidate. At this point, the question that crops up is: if Gina Reyes is really an American citizen, she should not have been allowed altogether to run last May. But the fact is that in various forums she had been presenting evidences of her Filipino citizenship, e.g., an Identification Certificate from the Bureau of Immigration dated October 2005, various Philippine passports, one as recently issued as March 2, 2011 and an affidavit of renunciation of US citizenship last September 2012. But AFTER SHE WAS PROCLAIMED WINNER last May, this disqualification campaign started to be carried out by Comelec. What kind of dirty game is the poll body up to again? From what I understand, Reyes was not given DUE PROCESS in this disqualification decision, as Comelec gave full course only to petitioner Joseph Socorro Tan (who he?) who in turn relied on an unofficial document---which makes the case double hearsay. Reyes was not even given a chance to argue her case before Comelec and present her documents on Filipino citizenship. Comelec, which has been beset by innumerable crises of credibility especially in the Hocus-PCOS issue, suffers another blow here, as its move vs. proclaimed winner Reyes is viewed as arbitrary and reeking yet again of grave abuse of discretion---another travesty of justice by the poll body. Gina Reyes won’t take this reported proclamation on Tuesday of Velasco sitting down. She’s calling a press conference tomorrow at 10 am. at her House office. As the nation awaits the State of the Nation Address by President Aquino exactly a week from tomorrow, the House would predictably be in turmoil over the unresolved Reyes-Velasco bout. A question that will definitely crop up is, why is this sort of thing happening, with decisions being made and reversed on flimsy ground, bereft of due process, in the nation's highest repositories of authority? In fact the nation could be staring at a looming constitutional crisis between Comelec and Congress on lawful jurisdiction of the House of Representatives Electoral Tribunal (HRET). By way of background, on June 19 Velasco filed before the Comelec First Division a protest vs. the PBOC proclamation of Reyes and sought her disqualification. Not long after, there followed the 19-page en banc Comelec decision annulling Reyes' proclamation as “without any legal force and effect” and proclaiming Velasco winner. It was issued by Chair Sixto Brillantes and Commissioners LucenitoTagle, Padaca and LuieGuia, one of the two newest appointees. Dissenting were Commissioners Christian Lim and Al Parreno, the other most recent appointee, with one abstention. The dissenters rightly argued that there’s already an absence of Comelec jurisdiction over Reyes’ case owing to her proclamation by the PBOC and her oath before the Speaker. Reyes immediately appealed the Comelec decision to the Supreme Court, stressing that she was already under the jurisdiction of the HRET. On June 25 the SC came out with a split decision---7-4-3-1. Seven justices, led by Chief Justice Ma. Lourdes Sereno, came out with a majority ruling penned by Justice Jose Portugal Perez (said to be a UP law classmate/roommate and fraternity brod in Sigma Rho of candidate Velasco’s father, Justice Presbitero Velasco). The majority decision said that for a congressional oath of office to be valid, it must be administered by no less than the Speaker AND IN PLENARY SESSION. But because the 16th Congress will only convene on July 22, the Court maintained that Comelec retain jurisdiction over Reyes. The media readily interpreted the SC majority decision as clipping the powers of the HRET, but Court observers saw it as accomodating the wish of one of their own, Justice Velasco. This accomodation was hinted as a secondary point---but there it is nonetheless---by four justices, namely, Justices Antonio Carpio, Arturo Brion, Martin Villarama Jr., and Marvic Leonen in their 21-page dissenting opinion, penned by Justice Brion, a bar topnotcher in the early '70s. Said they: "...unless the case is clearly and patently shown to be without bases and out of our sense of delicadeza, the Court should at least hear and consider both sides before making a ruling that would favor the son of a Member of the Court." As my granddaughter would put it, ouchy. On the other hand, three justices, Justice Velasco himself and Justices Estella Bernabe and Jose Catral Mendoza, who were both sponsors at Lord Allan Jay’s wedding some months back, inhibited themselves in this ruling while Justice Diosdado Peralta was abroad. Last July 9, Comelec en banc ruled that the votes of Reyes should be considered as “stray” and reports indicate that Velasco would be proclaimed winner this Tuesday. At last Thursday’s press conference where she asserted her Filipino citizenship, Gina Reyes came swinging at the power behind her rival’s impending proclamation---his father, Justice Velasco, who has been quite a controversial figure in the SC and in media. An option her camp is considering is filing a motion for reconsideration with the SC. But from here on political considerations would predictably factor in, e.g., no one would be surprised if the seven justices face impeachment charges in the LP-dominated House. Aside from the ramifications on the vast powers of the HRET clipped by the SC majority decision, it should be noted that Gina Reyes ran as an LP vs. Velasco (who ran under the smaller NUP), and in fact she was sworn into office by President Aquino himself at Malacanang, together with other elected LPs. Thus, the Comelec’s axing her does not seem to jibe with its perceived image as a tool of Malacanang. Moreover, Speaker Belmonte swore her in a second time, and his loyal lieutenant, Majority Leader Neptali Gonzalez Jr., is known to be helping Gina. How would Belmonte protect the HRET which was chaired in the past 15th Congress by Justice Velasco himself? How come Lord Allan Jay Velasco is lording it over Gina? Is it clearly the power of Justice Velasco that’s operating here? SC’s long day’s journey into night last Tuesday on RH Law just Round 1. a CJ Sereno’s query on penurious state of her P10, 000-a-month clerk prompts counter-query: why doesn’t CJ compensate her more if she's honest? If SC justices are not up to making competent judgment on issue of when life begins, perhaps better to prolong SQA on RH law---for good. Last Tuesday was a super-long session at the Supreme Court, starting at about 2:30 pm. and adjourning around 7:30 pm. Chief Justice Ma. Lourdes Sereno, after giving way to all her colleagues to pose questions on the issue of the unconstitutionality of the RH Law, RA 10354, took her turn to grill Atty. Ma. Concepcion “Girlie” Noche, who by then had been standing on her feet for about four hours straight. Girlie Noche, an Ateneo '82 law graduate and professor there, and head of the Alliance for the Family Foundation, Inc. (ALFI), a staunch pro-Life group of professionals, from time to time would seem to falter amid intense grilling from the justices. But I thought she held her own pretty well, valiant and courageous. 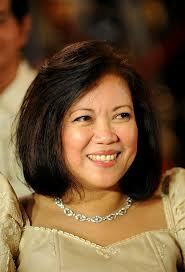 CJ Sereno’s initial question meant to shock. She asked Noche if she would be committing an ‘impeachable offense’ if she were to recommend to her unnamed office clerk---who was getting on in years but who had already many children (how many CJ didn’t say)---to seek counsel from a government doctor on how to stop having more children. Sereno said her employee was admirable for her integrity and honesty. For while she only earns P10,000 a month (salary grade 6), and her husband does not earn much either, and they rent a tiny house in Fairview, Q.C. for P4,000 a month, still, said Sereno, this employee does not succumb to temptations to sell information or documents from the CJ’s office to unscrupulous elements. So, would Sereno be impeachable if she recommended that her clerk take contraceptives to stop bearing children? Lawyer Noche was dumbfounded for a while, obviously not expecting this question from the CJ. After a studied pause she replied bravely but almost inaudibly, “I think so, Your Honor,” adding that said employee should take to natural family planning as contraceptives, being mostly abortifacient in nature, could endanger her life and give her family a huge health problem. My first reaction as I listened to Sereno was: why doesn’t she raise her valued employee’s take-home pay, to begin with! Then I began to feel sorry that this employee’s story had to be publicly aired by the CJ, for even though she remained unnamed the whole court knew who Sereno was referring to. If she is the stiff-upper lip type who wants her dignity intact despite her penurious state, that's now shattered. I also thought that CJ's story is an indictment of the sorry state of our bureaucracy, how little bureaucrats are paid---when juxtaposed with how senators and representatives are running wild with citizens’ taxes in their pork barrel, committee and oversight committee budgets and allowances, travel expenses, etc. The low salaries of bureaucrats are, of course, the major reason why many of them succumb to worldly temptations and unabated graft persists in government offices, and why technocrats such as the former PAGASA director forsake their jobs here for salaries ten times higher in the Middle East. Then too, it’s no secret that the judiciary is a secret world of its own with enormous fiscal autonomy, and that the CJ has huge discretion and wide latitude to augment take-home pay and promote people co-terminus with this post. This is why the story about CJ's seeming inability to help her trustworthy employee’s financial lot doesn’t quite jibe. CJ Sereno lectured lawyer Noche about the predicament she and her SC colleagues find themselves in vis-à-vis the RH law, and this was echoed by Justices Antonio Carpio and Marvic Leonen. 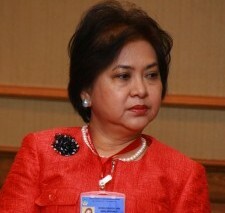 She said that groups opposing the RH law should help the justices balance the right-to-life provision with other provisions of the Constitution; that they need to be provided “a more layered approach” to this law, given its complexities and many conflicting considerations, and "not just half a sentence." For Sereno, it was “balance, balance,” as she told Noche, “You are substituting 15 un-elected people in the SC for 286 people in Congress and the President” in the anti-RH people's move to challenge that law in the SC. She also opined that there were only three or four members of the Constitutional Commission of 1986 who had insisted on the 'fertilized ovum' interpretation of the beginning of life, instead of the more widely accepted belief that it begins with implantation. “We are more humble here than a few ‘moral’ people,” said Sereno, obviously referring to Dr. Bernie Villegas, Bishop Teodoro Bacani and Chito Gascon who pushed this provision. As I listened to Sereno at this point I must confess that I felt sad: that the highest magistrate of the land would disparage the framers of the Constitution was most unfortunate, and has no place in a society based on laws. Noche valiantly countered that the above Commissioners were among the most active in the ConCom and that this entire body resoundingly voted 32-8 on the Constitution's stellar provision on equal protection of the life of the mother and of the unborn FROM CONCEPTION. In addition, she argued, the Charter was overwhelmingly ratified by the Filipino people in 1987. Justice Leonen questioned the capability of the people to fully understand the document they were ratifying back then, while on the other hand, he said, the SC justices, as guardians of the law, have to be careful about ruling on the constitutionality of a political body’s (Congress’) action. Meanwhile Justice Carpio impliedly questioned Noche’s assertion that the fertilized ovum is already a full human being with 46 chromosomes and a DNA, by saying that even the medical world was divided on the question of when life begins, or which contraceptives are harmful abortifacients and which were not. Carpio stressed that the justices are not doctors and would be hard-put to tackle this question. The drift of justices close to the Palace seemed to be, to quote CJ Sereno that the SC might have to exercise “judicial restraint” in seeking the balance with the two other departments of government. At that point, Girlie Noche obviously read the justices’ stand as prejudicial to her pro-Life group’s cause, and she hinted so, but Sereno cautioned her not to jump to conclusions. One might counter-argue that if the justices don’t feel up to making a judgment on RA 10354’s constitutionality, perhaps the best thing to do is to prolong the status quo ante state of the law---in other words, why don't they shelve it for good? This decision echoed the provision in the Civil Code that any legal question “properly brought” before the court has to be settled. To quote that 1979 decision, “Moreover, this case is before the Supreme Court and being the court of last resort, it is the final arbiter of all legal questions properly brought before it and its decision in any given case constitutes the law of this particular case. Once our judgment becomes final, it is binding on all inferior courts, and hence beyond their power and authority to alter or modify (Kabigting vs. Acting Director of Prisons, 6 SCRA 281.286)..."
Let’s hope and pray that the justices of the High Court will all go down on their knees in the next few days and pray to God that they be given the wisdom to see the immense ramifications of their final decision on RA 10354 on Filipinos for generations to come.